Choosing which crops to plant in your garden can be a lot of fun – and maybe a little daunting. 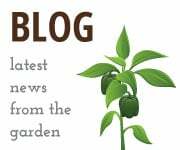 Below, a list of options for spring, summer and winter gardening in Chicago, plus planting and harvesting tips. March 15-May 30 or Aug. 15-Sept. 15. 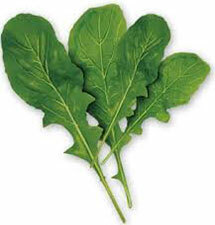 Arugula can be planted up to three weeks before the first frost (generally Oct. 15). Plant from seed. Plant an abundance of seeds (you want to overplant), and cover the seeds with about 1/4 to 1/2 inch of soil. Arugula will germinate quickly, and they need to be eaten quickly before they develop a seed stalk and get bitter and tough. Begin harvesting arugula at baby green size (2.5-3 inches). Cut it and leave about 1.5 inches of growth, let the plant grow back to 2.5-3 inches, cut again and remove entire plant. Eat when young. The bigger arugula gets, the spicier it gets. Transplant seedling or direct seeding. Begin harvesting as soon as the plant is large enough to spare some leaves. At any sign of flowering, pinch off the flower unless you have so much that you’re intentionally letting it flower. Once basil flowers, it spends more energy on the flowers than the leaves. At that point, the leaves can become bitter and tougher, and not as pleasant for pesto and fresh eating. Cut the flower with a pruner at a point along the stem just above a fresh set of leaves. If done correctly, it still looks busy and full. Plant from seed. Direct seeds about 1/2 inch deep about 1 inch apart. Beets planted March to May will be ready early summer to mid-summer. Beets planted July to August will be ready for mid to late fall harvest. Thin beets so they are a fist’s width apart. Do not thin as soon as they emerge. Wait until greens are 1/2 inch–1 inch tall. After thinning, mound the soil and firm it around each plant. Beet thinnings can be consumed. If you see the top of the beets come above the ground, cover them with earth. Harvest is approximately 60 days from planting. 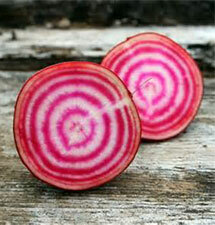 Around the 60th day, pull one of the beets and see if it is about 1.5 inches in diameter. If so, begin harvesting. If you would like bigger beets, wait. Keep an eye on them. If pests such as squirrels or chipmunks are munching on them, harvest on the early side of ripe and place tomatoes in a window sill to finish ripening. Judge ripeness by color and touch. Is the tomato the color it’s supposed to be? When you gently press into the skin, does it give a little and feel somewhat soft? Keep pruning to a minimum if at all as this can spread disease. If fruit is ripening slowly, remove excess foliage to expose the fruit to more sunlight. Broccoli is ready when a firm, tight head is formed. The broccoli head typically will get to be 4-7 inches wide when it is time to harvest. But do not go on size alone. If florets are not tightly packed and begin to separate, then you should harvest immediately or the florets with bolt and become bitter. When the florets on the outside edge of the head get to be the size of the head of a match, then you can start harvesting broccoli from that plant. 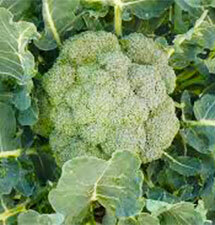 Use a sharp knife or pruners to cut the head of the broccoli off the plant. You should cut the broccoli stem a few inches or more below the head. After you have harvested the main head, you can continue to harvest the side shoots from the broccoli. These will grow tiny heads to the side of where the main head was. Harvest the in the same fashion as the broccoli head. April 15-June 15. 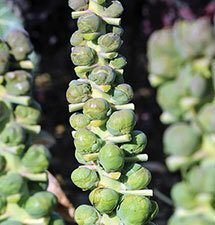 In our area, plant Brussels sprouts by June 15 to make sure there is enough time for the buds to develop. Brussels sprouts benefit from a late harvest; they become sweeter once they have experienced a light frost. Brussels sprouts are very cold tolerant. Harvest when they are slightly smaller than a golf ball. They can be harvested around Thanksgiving or shortly thereafter; taste often improves after a frost. These peppers are sweet from the start, and they will be sweetest when harvested at their deepest red color. Simply pick by hand when ready. 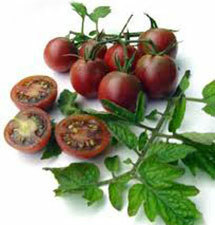 The Carmen is an Italian variety, and works best roasted or fried. 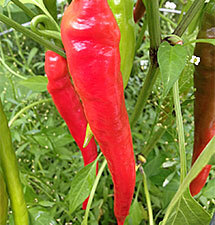 This pepper is very adaptable and disease resistant, and a fine candidate for containers or indoor planting. March 15-July 15. If you want a carrot crop that is ready before winter sets in, your last chance for seeding is July 15. After that date, any carrots you plant will need to be covered with fabric (such as a spun polymer fabric) or straw-mulched, and harvested early winter. Carrots take 65-75 days to mature, depending on the time of year and weather conditions. When the tops of the carrots are 2 inches high, thin the carrots, leaving 2-3 fingers’ width (approximately 1.5-2 inches) between each plant. Carrots are sweetest when harvested in cold weather. Time your planting so the harvest occurs in fall or early winter. For carrots that have 90 days to maturity, plant in early July to harvest in October. Plant seedlings purchased from a nursery or started from seed indoors 8 weeks before the average last frost (usually May 15 in Chicago). Plant after the danger of frost has passed (usually after Memorial Day in Chicago). Make a planting hole twice as large as the container the seedling is in, remove seedling from pot, open the roots with your fingers, and place in the planting hole. Plant deeply, up to the first set of leaves, and tuck the soil back around the plant stem. Water the root area well, and keep moist during the first 5-10 days after transplanting. 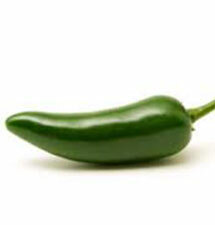 The cayenne pepper is a long, thin, classic hot pepper. While these peppers are mildly hot, they are still slightly sweet. 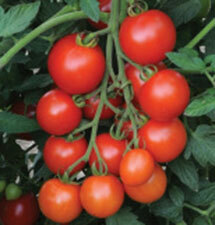 Best harvested when bright red, simply snip the stem from the plant. 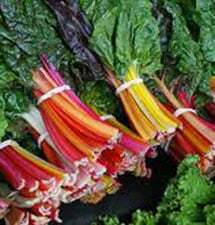 For an early spring harvest, continuing into summer, seed chard by Sept. 20. Plant from seed. Direct seed about 1 inch deep, about 6-8 inches apart. Swiss chard seeded as a season extension crop can be harvested as a baby lettuce green in late fall (harvest outer leaves only if you want to have chard grow into spring). 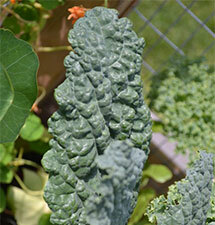 Just like kale, harvest just the outer leaves and limit harvest to 3-4 leaves at a time. Do not take all leaves off at once, and make sure to leave the tender center leaves to grow into larger leaves. 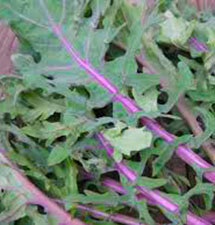 Apart from the root of the beets, the leaves can also be used similarly to chard – eat raw, cooked, or juiced. Harvesting beets depends on the size you prefer to consume. Beets start to become harvestable when their tops protrude above the soil. The best beets tend to be darker in color with smooth skin. If you wait too long, they can become fibrous or soft and squishy. A classic herb with fresh, bright flavor. It’s a staple in fresh salsa, pico de gallo and guacamole. Cilantro likes cool weather and will grow fast in the early months. Harvest the green leaves and avoid cutting away more than one third of the plant. Later in the season, the plant will develop flowery stalks. When these seeds dry and turn brown, you can harvest them as coriander. Clip the round seed heads, place upside down in a paper bag, and in a few days the husks will split, dropping the edible seed. You can plant repeatedly throughout the season to get a continual harvest. This is a great candidate for container growing. Plant from seed or transplant seedling. Thin aggressively - you will be rewarded! Ultimately, get the plants thinned to 8-12 inches apart. Harvest the leaves from the bottom up and tidy the plant as you go. Remove and discard of any old, yellowed leaves at the base. Cut the leaves at the base. Do not take all of the leaves off at once. This ensures that the plant will continue to regenerate. Collard greens are great both raw and cooked - often sautéed with onion. We also recommend that you eat the thinnings as you go. Thin the plant and leave the healthiest, largest seedling in the ground (usually 3 to 4 seeds are planted to start if using direct seed). Cucumbers like to climb - attach them to a fence, trellis, or cage with loose ties. The fruit is well camouflaged - look closely as it can hide from you! Once you harvest your first cucumber, look for new fruit daily. Don’t wait too long - delicious when young. 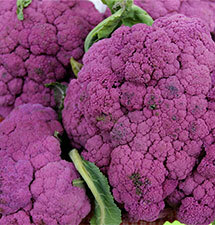 A deep pink Italian variety, mild and not bitter with a classic shape. Harvest 60 to 80 days from when you put the plant in the ground. Use a knife or pruners to cut the stem during harvest. Harvest as soon as the fruit seems ready, and avoid letting it touch the ground so that bugs and critters don’t get to it. If started from seedling, it’s ready in 2-3 weeks; if started from seed, it’s ready in 30-45 days. There are two ways to approach harvest: If growing for a head of lettuce, thin 8 inches apart, eat outer leaves until it’s getting vertical height then pull it out. Or use the “cut and come again” method. Do not thin. Cut with scissors. 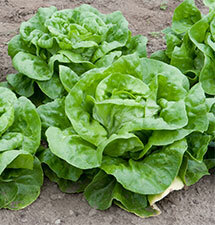 Harvesting can begin when lettuce is 3-4 inches tall. Once it starts to taste bitter, pull it out. If harvesting lettuce when hot, “hydrocool” it – let lettuce sit in a sink full of cold water for 5-10 minutes, then spin in salad spinner and eat, or store in well sealed storage container or Ziploc bag (air-tight storage is key). Easy to grow and great for attracting beneficial insects to the garden. You can start harvesting as soon as the plant has four to five leaves. 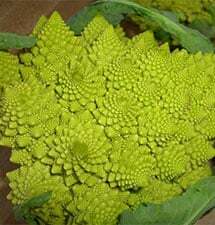 Cut the feathery leaves off with scissors or just pinch with fingers. Dill is classically paired with potatoes, cucumbers, eggs, and fish. Try pickling your own veggies and adding in dill for flavor. Named for their fun variety of colors, the Easter Egg Radish comes in a beautiful mix of red, purple and white round radishes. 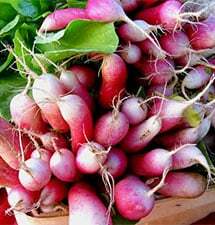 Radishes can be harvested at most any size, and these in particular maintain a great mild taste and crisp texture if you let them get a bit larger. Pull the plant straight up out of the ground so as not to disturb surrounding radishes that are not quite ready. Plant from seed. Direct seed about 1 inch deep and about 1.5 inches apart. Coat the seeds with a soybean inoculant mixed with water prior to planting. This will help the seeds get a better start. Edamame matures in 75-90 days. Pay attention to how plump the pods are. As soon as they are slightly plump, open up one and look inside. If the beans look at all ripe, start eating. 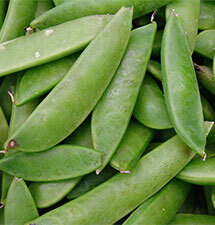 Edamame is ripe when the seed inside the pod is bright green and tastes sweet. Harvest and eat frequently for the next two to three weeks. With its hot and spicy flavor, this variety was originally often used in fish and shellfish cooking in the Northeast. Colors range from green, orange, brown, white, and red - sometimes a stripy mix of pigments. The plant also produces beautiful ornamental green/white mottled leaves. Be sure to search for the lighter colored peppers as they can hide in the leaves. Simply pick the peppers by hand when ready. 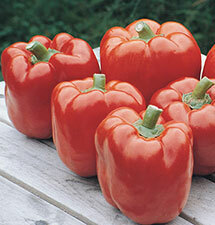 This is a good variety for container growing, and also great for drying into chili powder. You can harvest radishes at almost any size. However, the longer you leave them in the ground, the spicier they become. 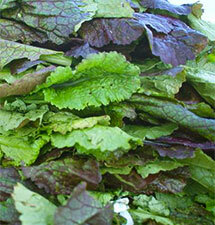 If you want them for salads, harvest them when they are smaller which is when they are crisper. Pull the plant straight up out of the ground so as not to disturb surrounding radishes that are not quite ready. 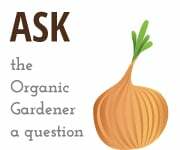 You can either buy a bulb of seed garlic or certified organic garlic. Break the bulb into its individual cloves and plant the garlic clove with the point facing up and the root (base of the garlic) facing down. Plant the clove 4-6 inches below the soil and 6 inches apart. If you planted a hard-neck variety, in the early summer, the garlic will shoot up a seed stalk from the middle. These should be cut and can be eaten as delicious garlic "scapes." 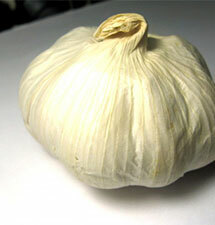 In mid-summer, around mid-July, garlic can be harvested. You know for certain they are ready when the tops start to turn yellow or brown, or if you poke your finger under the soil line and feel for a bulb about 3 inches in diameter. When the stalks begin to yellow or brown, bend them over to allow them to dry; pull the garlic a couple of weeks later. If you want to store garlic through the winter, clean it off and dry it for a couple weeks in a cool, dry area with good air circulation; stalks can be braided and hung. 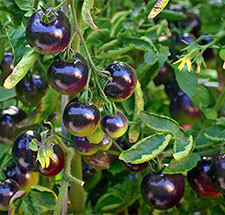 This is a cherry type of tomato in bright purple and yellow colors, gathering in long clusters with small fruits. The gold berry has a sweet and rich flavor, and the plants are productive and sturdy. This tomato benefits from growing in a cage—gently direct stems to grow vertically, allowing the plant to grow as tall as possible while remaining contained in the cage. Judge ripeness by two factors: bright yellow color with indigo-purple shoulders and a slightly soft feel that gives a little when touched. Prune minimally, if any, as this can spread disease. Some years, if your fruit is ripening slowly (approximately mid-August), give the plant a haircut by removing the topmost central branch, and remove excess foliage to expose the fruit to more sunlight. 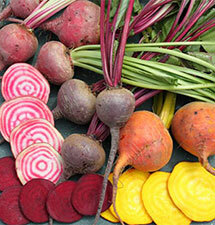 Apart from the root of the beets, the leaves can also be used similarly to chard – eat raw, cooked, or juiced. Harvesting beets depends on the size you prefer to consume. Beets start to become harvestable when their tops protrude above the soil. The best beets tend to be darker in color with smooth skin. If you wait too long, they can become fibrous or soft and squishy. 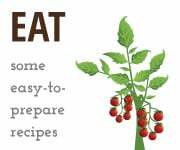 For beet greens, harvest starting around five weeks, or when leaves are about 3 inches tall. March 15-Aug. 1. 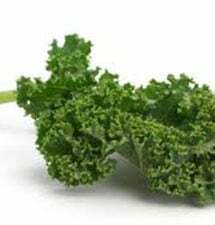 Kale can be planted throughout the season, but the later in the season, the less likely you will be able to harvest full-grown leaves. The last date you can plant kale as a transplant for full-grown plants would be around Aug. 1, earlier being better. Thin aggressively. Thin to 8-12 inches apart. Harvest the leaves from the bottom up and tidy the plant as you go. If there are old, yellowed leaves at the base, remove and discard them. Cut leaves at the stem/base. Do not take all the leaves off, so it will continue to regenerate. If you harvest turnips when small, they will have a milder, sweeter taste. When they are exposed to mild frost they also become sweeter, but you have to pull them before a heavy freeze or the root may crack and rot in the soil. Pull as soon as roots mature. Turnips that are ready will poke out of the soil level a bit just at the top of the root when they are ready. The best thing to do would be to pick one to evaluate the size. After harvesting the turnip root, cut the greens off and store in a cool spot. Plant from seed. Direct seed about 1.5 inches deep and about 2-3 inches apart. Coat the seeds with a bean/pea inoculant mixed with water prior to planting. This will help the seeds get a better start. 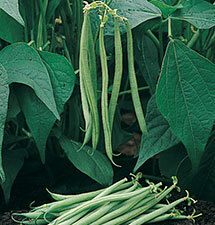 Start harvesting when beans are young and tender, around 3-4 inches. Harvest frequently to ensure the plant produces more. Look closely while harvesting as beans may be hiding from view. Keep harvesting even if you are not eating the beans so they keep producing. Do not wait too long to harvest – this is a rookie move! Young lettuce is very tender and sweet. It grows quickly. If started from plant, it’s ready in 2-3 weeks; if started from seed, it’s ready in 30-45 days. There are two ways to approach harvest: If growing for a head of lettuce, thin 8 inches apart, eat outer leaves until it’s getting vertical height then pull it out. Or use the “cut and come again” method. Do not thin. Cut with scissors. 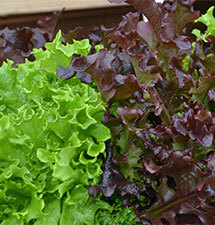 Harvesting can begin when lettuce is 3-4 inches tall. Once it starts to taste bitter, pull it out. If harvesting lettuce when hot, “hydrocool” it – let lettuce sit in a sink full of cold water for 5-10 minutes, then spin in salad spinner and eat, or store in well sealed storage container or Ziploc bag (air-tight storage is key). Be patient. Peppers need lots of sun and time to change color. If you want green jalapeño peppers, harvest when green. The color change is what really takes time. They are heat-loving plants and will likely be ready for harvest in September or October. Harvest 60-80 days after planting. Cut the stem with a knife or pruners to harvest. 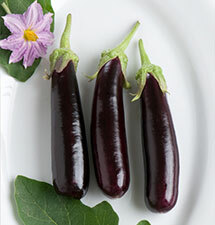 If the eggplant is touching the ground, harvest as soon as it seems ready – before bugs or critters get to them. Plant from seed. Direct seed about 1/2 inch to 1 inch deep, about 6-8 inches apart. Kale planted late in summer or early fall will yield an early crop of kale as soon as you can open your season extension. Harvest lightly, 3-4 leaves at a time, until the cover can be removed when temperatures are consistently above freezing. Do not take all of the leaves off, so it will continue to regenerate. Plant from transplant seedling or direct seed. A silvery-green plant with lemony aroma and flavor. Taking care to harvest your herb will ensure that it continues to produce and look attractive. Begin using the leaves as soon as the plant is large enough to spare some. To harvest, cut a handful of the basil and leave at least a third of the stem so that it continues to produce. Unless you are growing the basil as an ornamental, cut or pinch off the flowers so that the plant can focus its energy on the leaves. This basil is a nice addition to sweet and savory recipes that already contain lemon flavors - don’t replace lemons with the basil, rather add it to enhance the lemon flavor. Try crushing it up and adding it into lemonade! Great candidate for container growing - planting this variety in containers around your patio or outdoor space will help repel mosquitos and flies. Plant from seed or transplant seedling. Cucumbers are very sensitive to cold, so it is important to make sure that both the soil and air have fully warmed before planting. Thin and leave the healthiest, largest 1-2 seedlings in the ground (usually 3-4 were planted to start). Cucumbers like to climb—help them attach to a fence, trellis, or cage with loose ties or plant Velcro. 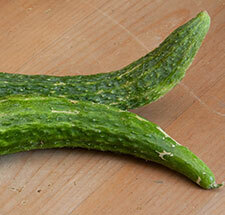 The lemon cucumber is sweet and versatile, often served raw but also a great pickling cucumber. They may be harvested young or can wait. They are delicious at any time. This variety is late to begin bearing fruit. For a late fall harvest, seed by Sept. 20. Plant from seed. Direct seed about 1/2 inch to 1 inch deep, with about 20 seeds per foot. Because of the slow growth period of late fall and early winter, do not expect large heads. 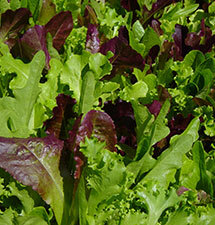 Winter lettuce is best grown as a baby lettuce mix. Cut with scissors or a sharp knife once there are 6-8 leaves per plant. Be sure to re-cover the plants after harvesting or checking on your late season crops. When leaves are about 3-4 inches high, you can harvest using the "cut and come again" method. Using a knife, cut about an inch from the ground, allowing the small center leaves to remain to grow into the next round of lettuce. Using this method, you will generally be able to get 2-3 harvests before the lettuce becomes tough and bitter. Use hydrocooling when harvesting in warm weather. Similar to lemon basil, the lime variety has a mild citrus taste and bright lime scent. A great addition to sauces, salad dressings or salsas. Taking care to harvest your herb will ensure that it continues to produce and look attractive. Begin using the leaves as soon as the plant is large enough to spare some. 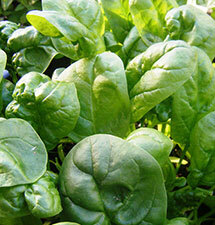 To harvest, cut a handful of the basil and leave at least a third of the stem so that it continues to produce. Unless you are growing the basil as an ornamental, cut or pinch off the flowers so that the plant can focus its energy on the leaves. This is a great candidate for container growing. Bright orange, gold, and red flowers add accent color to the garden. We grow marigolds as companion plants not just for beauty, but to attract beneficial pollinators for the entire garden. Plant either from direct seed or transplant seedling. Cucumbers are very sensitive to cold, so it is important to make sure that both the soil and air have fully warmed before planting. These unique cucumber-like fruits look like baby watermelons and have a sweet-and-sour cucumber taste. They’re a tiny variety and will grow to just 1 to 2 inches. Thin the plant and leave the healthiest, largest seedling in the ground (usually 3 to 4 seeds are planted to start if using direct seed). Cucumbers like to climb. Attach them to a fence, trellis, or cage with loose ties, but this variety does have a pleasing mounding habit. Once you harvest your first cucumber, look for new fruit daily. This variety also produces a nice ornamental flower on its climbing vines. Great for pickling or to toss into a salad. This is a very fun variety to plant with kids. 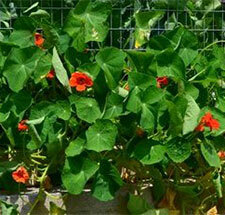 Nasturtiums are easy to grow annuals with edible leaves, and they are great for growing with children. These crops feature bright greenery and red, orange, and yellow flowers. They are great as a cut flower. Cutting the faded or dead flowers throughout the season will help to keep the plant productive. If growing in containers, you may need to trim them back throughout the season. Do not over water. Be patient. In order for the peppers to change color, they need lots of sun. When you’re ready to eat, as indicated by the full color change, snip the peppers off at the stem and enjoy. These are best eaten raw as snacking peppers. A great companion plant to most vegetables in the garden. Trim regularly once the plant has reached 4 inches. Harvest leaves as needed - they store well and can be dried. Oregano is a classic flavor in Italian cooking - add to homemade pizza or pasta sauce. Plant from seed about 1/2 inch deep and about 1 inch apart. 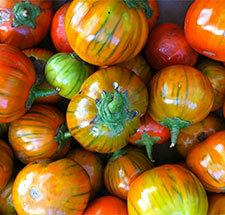 This French heirloom variety is short, stout and round in a classic orange color. Its short roots make it a great candidate for container gardening. Carrots generally take 65-75 days to mature, depending on the time of year and weather conditions. Thin the carrots when the carrot tops are 2 inches high, leaving 2-3 fingers’ width (approximately 1.5-2 inches) between each plant. 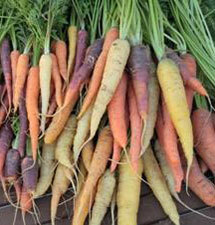 Carrots are sweetest when harvested in cold weather because the sugars become condensed. Time your planting so that you’ll be harvesting in fall or early winter. For example, plant carrots with a 90-day maturity cycle in early July to harvest in October. Begin to harvest parsley as soon as the plant is growing strongly. Cut individual outer stems toward the base to ensure the plant will continue producing. Parsley is great for drying and freezing, a classic flavor used in savory dishes or as garnish. This is a great candidate for container growing. Sweet flavor and smooth, delicate skins. Thin the plant and leave the healthiest, largest seedling in the ground (usually 3 to 4 seeds are planted to start if using direct seed). Cucumbers like to climb. Attach them to a fence, trellis or cage with loose ties. The fruit is well camouflaged. Look closely as it can hide from you! 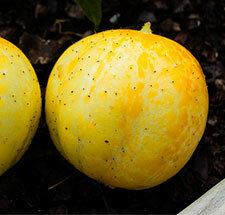 This variety is at peak sweetness at 4 to 6 inches in length. Once you harvest your first cucumber, look for new fruit daily. 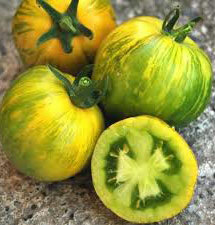 Though this variety is considered “seedless,” light undeveloped seeds are inevitable. The seeds growing within the cucumber tend to get larger the longer the fruit stays on the vine, so keep in mind for your texture preference. This variety is true to its name its with deep purple leaves and stem. It has a slightly spicy flavor with hints of clove. Taking care to harvest your herb will ensure that it continues to produce and look attractive. Begin using the leaves as soon as the plant is large enough to spare some. 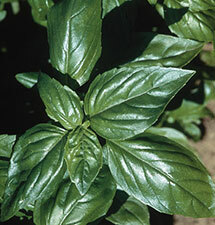 To harvest, cut a handful of the basil and leave at least a third of the stem so that it continues to produce. Unless you are growing the basil as an ornamental, cut or pinch off the flowers so that the plant can focus its energy on the leaves. Use in salads, oils and dressings. This is a great candidate for container growing. A deep red cherry tomato with unique green-bronze striping. Their complex sweet flavor makes them great for snacking. Prune minimally (if at all) as this can actually spread disease. If your fruit is ripening slowly (approximately mid-August in Chicago), give the plant a haircut by removing the topmost central branch, and remove excess foliage to expose the fruit to more sunlight. You’ll know it’s ready for harvest when the fruit gives a little when squeezed, and when it’s at its peak color. Store at room temperature rather than in the fridge. March 15- May 30. For a fall harvest, plant by July 15. As cauliflower grows, try to protect it from the light by tucking some of the surrounding leaves over the head or fastening them loosely together. A mature head should be firm and compact. Cut the head from the main stem, but try to leave a few leaves covering the head to prolong the fresh quality. March 15-May 30, or Aug. 15-Sept. 1. 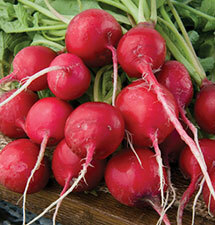 Radishes are best planted for harvest during cooler weather; the hotter the weather, the hotter the taste. Jeanne Nolan seeds radish from early April until late May, but you may be able to get a fall harvest with a late summer sowing. Thin so plants are 2 inches apart. Do not wait too long to harvest. Harvest when young, approximately 1-2 inches in diameter. Pull one at three weeks and keep an eye on them as radishes mature quickly. Pull as soon as roots mature. Radishes that are ready will poke out of the soil level a bit just at the top of the root when they are ready. The best thing to do would be to pick one to evaluate the size. Solid heads indicate when it is time for harvesting cabbage. If you squeeze the head and it’s firm all the way through, then the cabbage is ready for harvest. Cut at the lowest point below the head as possible, leaving the loose outer leaves attached to the stalk. Sometimes this will allow for a later cabbage harvest of sprouts, which will grow on the stem after the cabbage head is removed. 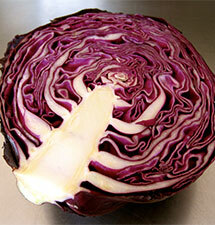 Try to harvest before abundant rainfall because cabbage heads are susceptible to becoming waterlogged. Begin harvesting when pods are 2 inches long. Check daily. They grow very rapidly and are very tender at between 2 and 3.5 inches but will become tougher as they get larger. Tasty simply sauteed with olive oil and garlic. The beautiful flowers are also edible with a sweet, mild flavor. Try using them as a garnish. Thin aggressively to 8-12 inches apart. Harvest the leaves from the bottom up and tidy the plant as you go. Remove and discard of any old, yellowed leaves at the base. Cut leaves at the base. Do not take all of the leaves off at once. This ensures that the plant will continue to regenerate throughout the season. The yard long bean is true to its name, with pods ranging from 14 to 30 inches at their peak - sometimes called a “noodle bean” for its length. 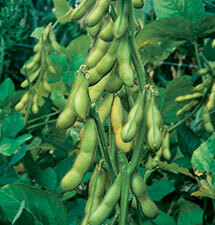 A traditional Asian crop, these beans can grow very quickly in warm climates. Start harvesting when young and tender, around 3-4”. Harvest frequently to ensure that the plant continues to produce more - even if you’re not going to eat all of them, make sure to keep picking. Look closely as the beans may be hiding from you! No thinning required. In fact, you may even have to tie the plant back. Feel free to cut the bean into shorter pieces for cooking and treat as you would a normal green bean. The burgundy color will fade when cooked. March 15-May 30. For a fall harvest, plant by July 15. Like cauliflower and broccoli, a mature head should be firm and compact. Cut the head from the main stem, but try to leave a few leaves covering the head to prolong the fresh quality. Another classic herb, rosemary is a woody-stemmed plant with needle-like leaves. You can cut the stems at any time and use the herb fresh. Also try hanging bunches of the stems upside down to dry, then strip the leaves off of the stems to use as a dried herb. Perfect baked into breads, added into oils or even included in wreaths and bouquets. This is a great candidate for container gardening. Harvest when the height is approximately 8-12 inches (or when they look like what you’re used to eating from the store). Pull out the entire thing. Eat roots and all. Plant seedlings purchased from a nursery or started indoors from 8 weeks before the average last frost (which is usually May 15 in Chicago). Plant after the danger of frost has passed (usually after Memorial Day in Chicago). Make a planting hole twice as large as the container the seedling is in. Remove from pot, open the roots with your fingers, and place in the planting hole. Plant deeply—up to the first set of leaves—and tuck the soil back around the plant stem. Water root area well, and keep moist during the first 5-10 days after transplanting. A small, mild Japanese pepper. Great for roasting, pan-frying, and grilling – the pepper’s thin walls take on great flavor when cooking in heat. 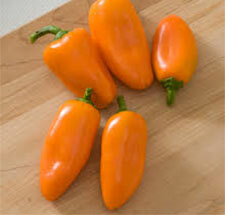 Typically harvested and eaten while green, but over time the pepper will turn orange with a sweeter flavor. Growing corn requires full sun and some space. Grow in at least a 5-square-foot patch. You must thin diligently, allowing 12” between each plant. When the corn is approximately 1.5 feet tal, mound the earth (create a small hill) up onto the stalk to help it stay erect. It is a shallow rooted crop and can easily blow over without mounding. This variety takes 92 days to mature and should reach about 5 feet tall. Pay attention to the silks. When corn is ready to be harvested, the silks start to look a little brown and dry. The ear should also have a little give when you squeeze it. The final test is to pull back part of the husk and pierce a kernel with a thumbnail. If milky liquid spurts out, the corn is ready to be eaten immediately. The silver queen variety produces nice big ears, with tender white kernels and a classic sweet flavor. Sorrel is a unique cold-hardy perennial green with tart, citrusy flavor. Great added into a salad of other raw greens. Harvest leaves when they are young and tender, keeping at least one third of the plant remaining to ensure continuous growth. Remove any flowers before they mature so that the plant can focus all energy on the leaves. This is a great candidate for container growing. Spicy greens mix is generally ready in 4-5 weeks. When leaves are about 3-4 inches high, you can harvest using the "cut and come again" method. Using a knife, cut about an inch from the ground, allowing the small center leaves to remain to grow into the next round of lettuce. Using this method, you will generally be able to get 2-3 harvests before the lettuce becomes tough and bitter. Use hydrocooling when harvesting in warm weather. Plant from seed. Direct seed about 1/2 inch to 1 inch deep, about 2-3 inches apart. 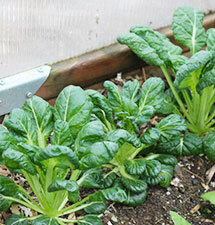 Spinach is the classic crop to grow over the winter. It tastes sweeter and becomes especially tender once it is exposed to frost. Harvest any plant that has 6 leaves that are 3-4 inches long. Cut the outside leaves to extend productivity, but limit harvest to outer leaves. Watch your peas carefully. They become ripe when the pods become swollen. Use two hands when picking peas, one to hold onto the vine, while pulling the pods off with the other. Peas are crisper when picked in the morning. You should continually harvest the pods to encourage more to form. Plant three seeds in one area, and thin to one plant, spaced 8-12 inches apart. 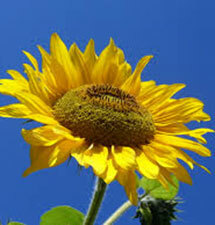 For harvesting seeds, wait for the sunflower to become brown. The head will be dry to the touch, and the seeds will be plump and black and white striped. The birds and squirrels may eat more of the seeds than the gardener. Once the seeds are ready to eat, rubbing the heads will loosen the seeds. A ribbed Chinese variety, the Suyo is free of bitter taste and is great fresh or pickled. They may be harvested young or can wait. They’re delicious at any time. The Suyo can grow up to 15 inches long. Plant from seed or transplant seedling (which are usually available as a four-pack from a local nursery). 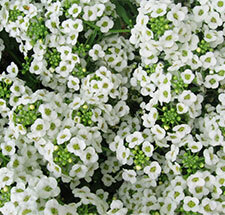 Named for their sweet fragrance, sweet alyssum can act as a lovely border plant, ground cover, or accent in a container. Bees love to visit sweet alyssum’s fragrant white or purple blooms, and the small size flower can attract other beneficial insects. While sweet alyssum can be used as a garnish or used to flavor light-bodied vinegar, we grow alyssum as a companion plant for beauty and to attract beneficial pollinators. 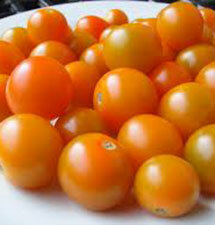 You can harvest while the leaves are young and tender (smaller than 4 inches) or after maturity. Cut off the outer leaves by snipping close to the base when the leaves are about 8-12 inches long. Always harvest from the outside in, as new growth comes from the center of the plant. For cooking, treat similar to spinach. Swiss chard works well sautéed with garlic or baked into egg dishes. Be patient. Peppers need lots of sun and time to change color. 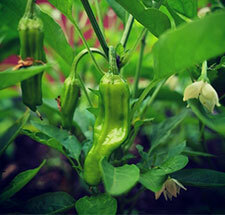 If you want sweet green peppers, harvest when green. The color change is what really takes time. They are heat-loving plants and will likely be ready for harvest in September or October. For a late fall harvest, seed by Aug. 15. For an early spring harvest, seed by Oct. 1. Plant from seed. Direct seed about 1/2 inch to 1 inch deep, with about 1 inch spacing between seeds. Because of slower growth during the winter due to cold temperatures and shorter days, plants will be smaller. In the early spring, once the cover can be removed enough to expose the plants, carefully remove the outer leaves for use in salads and stir-frys. Re-cover the plants and leave covered until freezing temperatures have left the area. Thai Sweet basil is an intense, spicy basil flavor with notes of clove and anise. Use it in any recipe that calls for traditional basil. 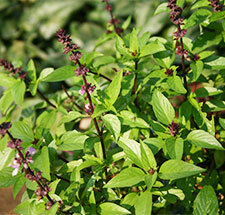 Thai sweet basil, unlike traditional basil, can be left to flower, which intensifies its anise flavor. A lovely herb for both its ornamental quality and savory taste. The green thyme plant also produces small white flowers - you can pinch these off to allow more leaves to produce, but the thyme’s flavor isn’t compromised by letting them bloom. Harvest as needed by clipping, and use a pinching motion with your fingers to strip the leaves from the woody stem before eating. You can easily dry, freeze, or preserve the leaves. This is a great candidate for container growing. 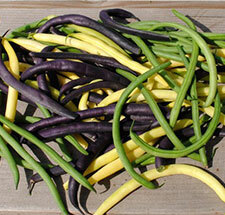 Tri-color bush beans are a sturdy mix of yellow, purple, and green beans that are tender, stringless, and juicy with a deep crunch. Start harvesting when young and tender, around 3-4 inches. Harvest frequently to ensure that the plant keeps producing more. Look closely—the yellow and purple pods are easy to spot, but the green pods can blend in with the foliage. No thinning required—you may even have to tie back. This eggplant is a beautiful heirloom variety from Turkey. It produces about 3-inch round fruits with a sweet and flavorful flesh. Harvest 60-80 days from planting date, when the fruits are green to light orange. Cut the stem with a knife or pruners to harvest. If fruit is touching the ground, harvest as soon as it seems ready—before bugs or critters gets to them. 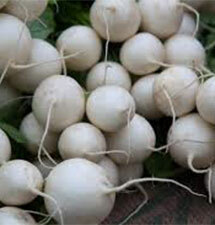 True to its name, this variety has a pale yellowish-white skin and crisp, clean taste. Thin the plant and leave the healthiest, largest seedling in the ground (usually 3 to 4 seeds are planted to start if using direct seed). Cucumbers like to climb. Attach them to a fence, trellis, or cage with loose ties. The fruit is well camouflaged. Look closely as it can hide from you! Once you harvest your first cucumber, look for new fruit daily. Delicious when harvested young, or you can let it grow. The seeds growing within the cucumber tend to get larger the longer the fruit stays on the vine, so keep in mind for your texture preference. A great variety for pickling. Start harvesting when young and tender, around 3 to 4 inches. Harvest frequently to ensure that the plant continues to produce more - even if you’re not going to eat all of them, make sure to keep picking. No thinning required. Plant three seeds in areas 12 inches apart. Thin to one plant (pick the healthiest plant). Harvest regularly, every other day; cut zucchini from the plant at the stem with a knife, or use a gentle twisting motion to free the zucchini from the plant. 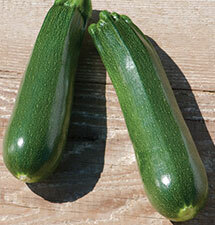 Start harvest when 4 inches long for the most tender zucchini, and harvest up to 8 inches long. Once zucchini gets too large, it is watery and seedy. For blossom harvest, choose the male flowers (which have a long stem and no bulbous bottom to the flower) at midday when open.